T hree years ago, Diana Dávila made the decision to dedicate her life to cooking Mexican food. She had just returned to her hometown of Chicago after a five-year stint in the Washington, DC restaurant scene and was on the hunt for an executive chef job. No position was jumping out at her until she came across a listing at a "Midwestern-Mexican restaurant." "The sound of that really resonated with me," says Dávila. "That is exactly who I am. It clicked." Dávila grew up in Oak Park, a small Chicago suburb, where she first started cooking at her parent's now-shuttered restaurant, Hacienda Jalapeños. But she spent her summers in Mexico eating and, most importantly, cooking with family. While she did eventually take that job at the Midwestern-Mexican restaurant, she wasn't there long before she left to start her own place, Mi Tocaya Antojeria. When Dávila envisioned the future, she never foresaw a life where she ran her own restaurant. "I saw what my parents went through with their restaurant," she says. "I saw how tiring it was for them." Still, as she saw it, she had no other option. Exploring Mexican food in the way she was most passionate about was just too important to her, and working for "someone who opened a Mexican spot just because everyone loves tacos" was not going to cut it. 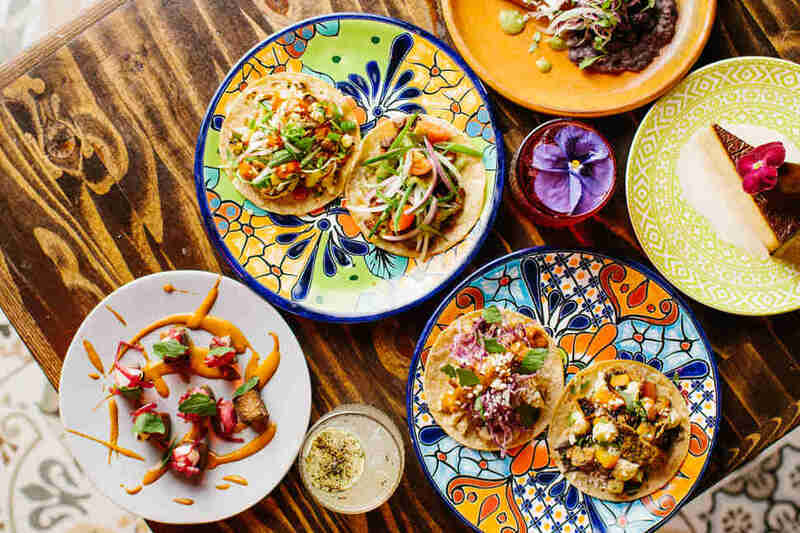 Now, on a corner of Chicago's Logan Square neighborhood, is Dávila's bright and bustling love letter to antojitos. Though the word is usually a stand-in for small plates, it literally translates to "small cravings," many of which are based on memories and moments from her life. She recounts a story of a friendly competition between her mother and an uncle who always loved to be in the kitchen. Her uncle, determined to outcook Dávila's mother, produced a dish of lengua con salsa de cacahuate -- or beef tongue with peanut salsa. Dávila's riff on the dish appears on the menu as peanut butter y lengua. "I like to think my version is the best," she says with a laugh. Dávila is being modest when she calls her sauce "peanut butter." In reality, it's a complex, deeply layered sauce made from peanuts, browned with roasted garlic oil, potent chile de arbol, bay leaves, black peppercorn, and salt-cured tomatoes -- not exactly what you'd find in a cafeteria sandwich. The nutty sauce is drizzled over a plate of tender, crispy cubes of beef tongue. Topped with bright pink rings of hibiscus-pickled onions for an acidic punch, the dish arrives to the table looking like a piece of modernist art. 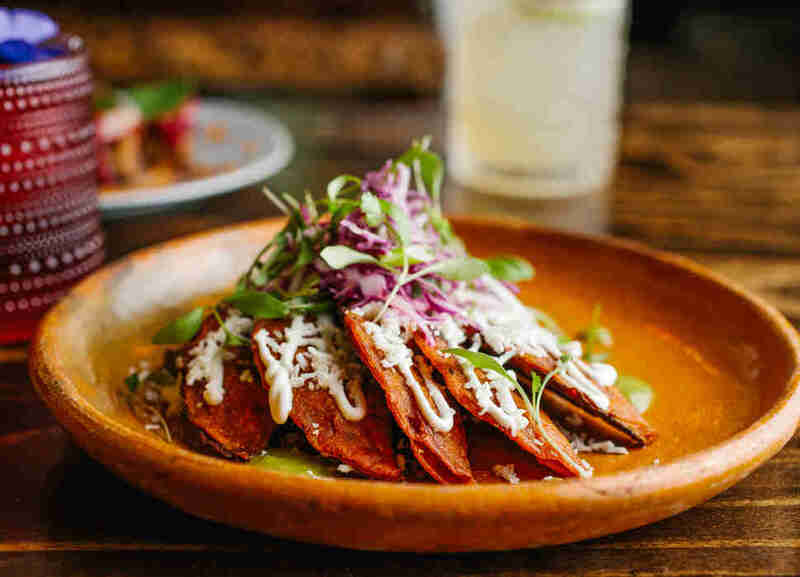 The idea of eating beef tongue might be hard for some people to wrap their head around, but Dávila is unapologetic in her cooking. Even items that have become staples of most Mexican restaurants in the United States are not as straightforward as they seem. The guacamole, which is satisfyingly smooth, arrives with a dusting of black ash made from serrano peppers. The draft margarita is made with delicately floral elderflower. 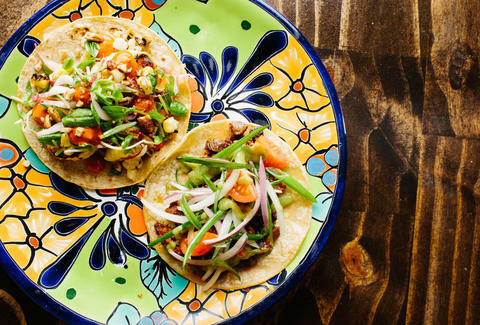 And while, yes, there are tacos, fillings range from hearty smoked beer-can chicken to garlicky shrimp topped with grilled corn and pecans. Dávila refuses to constrain her cooking to just one geographic area of Mexico at Mi Tocaya. "I don't want to be tied down to one region," she says. "I've been to a lot of places. Mexico is such a big country and not everyone has had the opportunity to go and really explore it." The results are playful -- on Sundays she offers the hangover-friendly chicken & churros combo -- as well as educational. I cannot stop thinking of Dávila's enchiladas potosinas -- essentially enchiladas reimagined as mini Hot Pockets. The enchiladas have a hue that almost matches that of Nacho Cheese Doritos, thanks to the chili puree folded into the dough. Each half-moon is filled with gooey cheese and smoky cascabel chilies, and arrives on a bed of earthy black beans, finished with a heavy drizzle of cooling crema and salty queso fresco. The enchiladas are from Dávila's familial hometown of San Luis Potosi in Central Mexico. "I would always get a huge bag of the enchiladas at the market when I went to visit," says Dávila. "They freeze well and I always would bring them home. Antojerias are all about sharing dishes, especially those from your culture." 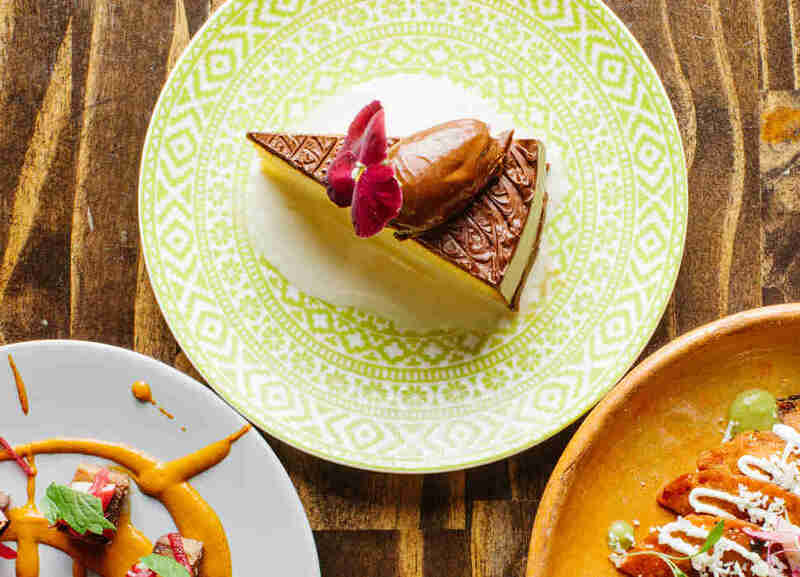 There are only two dessert options at Mi Tocaya -- a flan de queso and a tres leches cake. Go with the latter, which is covered in a layer of chocolate ganache and garnished with a flower. The cake is nothing short of life-changing, but Dávila didn't make it herself. Instead, she sources it from Kristoffer's, her favorite childhood bakery 10 minutes away in Pilsen. "I've been going there for who knows how long now," says Dávila. Every time it was a birthday or a celebration we'd go get a tres leches from Kristoffer's. And because we have so little oven space here, I figured why not just buy it from them." Bringing in the community was genius. I can't stop thinking about the cake, the enchiladas, and the beef tongue -- all "little cravings" that Dávila has transformed into giant ones. Khushbu Shah is the Senior Food Features Editor at Thrillist and thinks you need the beef tongue in your life as soon as possible. Follow her travels to the best restaurants around the country @khushandoj.